I am so excited to see my guava tree (it looks like a bush at the moment!) is growing nicely. It was so badly diseased that I chopped it completely back. 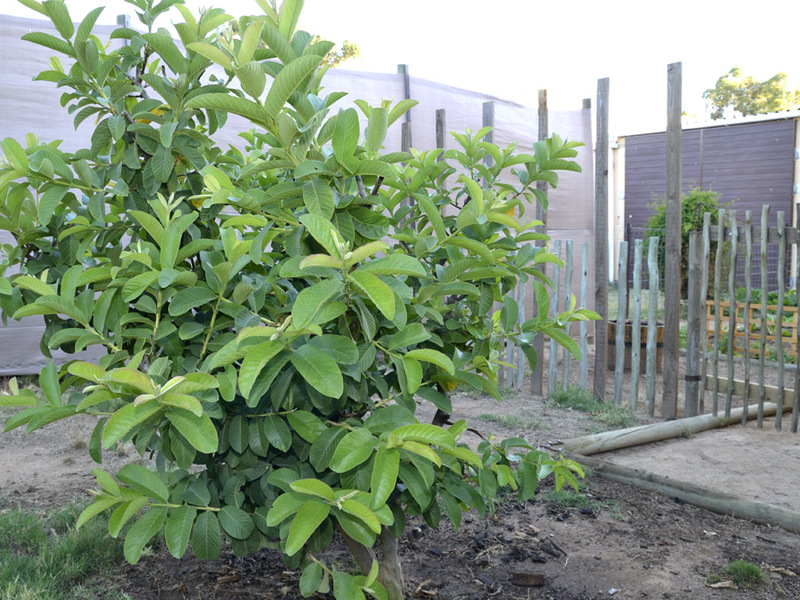 Now, it has broad, healthy leaves and a few new guavas!!! Hopefully I can boast a crop this year! Guavas is among the most popular of all fruits – they are full of vitamin C! It can be eaten raw or cooked, made into jam, jelly or fruit juice. They originated from the tropics but are very adaptable. They will grow in virtually any soil as long as it is well drained. It does love a sunny position and also loves to be kept well watered, especially when it is in flower. Best results is to feed in early summer and in autumn. The tree should be pruned and fed in October. The fruit is ready to be picked when it is soft to the touch and when the skin has turned from green to yellow. This is usually in April. Biggest pest is the fruit fly, so watch out for these. Hi Chris, I have a few green guavas already showing. They are the size of walnuts now, and (if all goes well) would guess harvesting around April/May. I didn’t have enough flowers this time, so I won’t have lots of fruit! Pity! The first year we were here it produced so many and it’s a small tree! So, there is potential! Good luck with the harvest! I’ve never had a Guava lol. That does look really healthy. Glad that it came back strong.